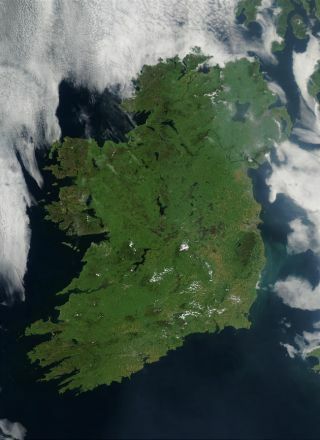 On August 7, 2003, the NASA Aqua MODIS instrument acquired this image of Ireland on the first day that summer that most of the island wasn't completely obscured by cloud cover. If wearing green and watching a parade isn't enough for youthis St. Patrick's Day, NASA has unveiled the emerald day's Irish homeland asit appears from space. Ireland takes center stage in a series of archived NASA satelliteimages released today by the agency's Goddard Space Flight Center inGreenbelt, Md. The views, taken by NASA's Aqua satellite and otherspacecraft, reveal Ireland as a verdant island covered in bright greenvegetation. Ribbons of blue-green phytoplankton can be seen faintly in theCeltic Sea just off the island's coast and south of Dublin. Dublin, the capital of the Republic of Ireland, appears as alarge gray-brown spot on Ireland's northeastern coast. Belfast, the capital ofNorthern Ireland, can also be spotted as a gray-brown spot on the eastern sideof Ireland on the coast of the Irish Sea. The Aqua photo was taken in 2003, but released Wednesday tomark St.Patrick's Day, NASA officials said. Another viewof Dublin, this one taken in 1994 using a radar instrument on NASA's spaceshuttle Endeavour and also released today, shows a close-up on the city and itsnatural harbor. The divisions between rural and urban areas are clearly visiblein the false-color radar image. WhyDo Some Clovers Have Four Leaves?